We have noticed that the player feedback is mostly negative and we want to address and acknowledge several points made by the community. Unfortunately as a business we are required to make money. We can't run the service off time donations and although I certainly can stand to skip a few meals I think our CMs should still be able to eat. So yes the purpose of this event is to make money. But we want to do so by encouraging player activity during the event period and not 100% direct sale of items. So based on that goal we are looking at revising the event refine rates as follows. The goal of these changes is to encourage players to hunt for more ores in game. By boosting the free ore refine rates we hope to incentive players to hunt on maps and gather these goods. Yes there are refine events planned in the future. Currently in the schedule we built out for 2018 the plan is to run a possible refine event for anniversary month, and then Christmas/New Years. We will also experiment with other event types such as a daily giveaways, gear quests with MVP drops, gear quests that do not require silvervine during the event period and others. It is important that we explore new avenues to encouraging player activity. Yes, players have noticed that Elunium and Oridecon have gone up in price. This is ultimately a good thing for players wishing to participate in the game economy. Increases in refinement stone prices mean that the rewards for hunting these stones have increased. This means that during this event you should want to hunt stones as you will be able to sell it for more zeny than you would without the event active. For smaller mmos events are their life blood. We need to run events because we do not have subscriber numbers that allow the server to coast along, its just the nature of the business. With RESTART we have the opportunity to define these events in a way that makes the sense for the RESTART community. Which is the goal in configuring this event the way we have. We are willing to listen to user feedback on how an event does and change it for the future but we must run events. If we are to run no events then eventually there will be extreme pressure from above to run an event off the shelf that performed well for a more traditionally monetized Ragnarok Server. So we will be moving forward with the event rates as listed in this thread and I hope that the community will provide feedback on what you experienced during the event, how it affected your activities while you played, and just your general view point. My team and I will read it all and take it into consideration for future event mechanic planning. Please note were also trying to make ores and gear easier to obtain from in game activity as well. The goal is to get butts in seats and playing. The problem is the effect on the economy and how it won't be worth upgrading anymore. There's very little in the economy for the average user (especially since consumables are no go) aside from upgrades/upgrade related activity really. On top of that what when the server is saturated with the overupped gear and the slotted +0 gear doesn't sell anymore? But you guys learn nothing from past mistakes as you are already repeating them over and over. The silvervines system was a good idea. Was enriched a good idea? About 50/50 but at least it's accessable to f2p players easier....but now u wanna go and do refine events. People on renewal already warned u on chaos over this. Then u implemented it, and it really killed a lot of the server. A lot of the people playing restart LEFT chaos to come here, or came back to the game, because it was free of the destruction you caused to that server. So you aren't "putting butts in the seat" you will just cause the butts who wanted to escape that, to leave. It's just had a bad precedent set on Chaos. First it's a little refine event, then it's a big refine event. I also think a drop event is a bit much too (I mean do we need that AND Halloween AND refine?) because it accelerates the server's aging. And you know why is a nightmare in Chaos? because every gear and card give you bonus for upgrade, and specially for those jRO items, here in Chodin RE:Start the only bonus for upgrade is the next ones, Cards: Nine tail, Carat, Orc Baby, Firelock. Gears: Survivor Rod (DEX / INT), Gentleman staff, Healing staff, Skull Cap and his Bonus weapon, mean Evil Bone Wand. of course weapons damage is still a thing, mean is not what everyone cry? mages are weak and blah blah blah? finally here is the chance where every mage can be "OP". I expect this event to break a ton of the +0 gear. Since there is no option to disable breaking. Currently were not endanger of being saturated with overrefined gear yet but it is something I am keeping in the back of my mind. Strike that I forgot about the Doram release event that we were pushed to do. To be honest I am trying to push the studio make more varied events, sales items, and promotions so we aren't always running the same cycles of refine events and costumes. Strike that I forgot about the doram release event that we were pushed to do. Were doing it this way so we can show that such promotional events don't need to only benefit the paid ores and can help with over all game activity. It was the requests to redeem points and the disputes about all the rules. It's the same company and the same management guys, why is anyone surprised if Restart follows the footstep of Renewal? It's futile to fight against it. Many of the good players have tried, and failed. WP will keep listening to the whales and bad players. I blame kRO though. Just have fun while you still can. But can't you see that 99% of players posting on here are NOT wanting this event. Please don't ignore what we're saying. Yes enriched ore will be cheaper... But regular ori and elu will skyrocket. New players won't have the funds for that still. Then +0 gear will skyrocket and new players won't be able to buy it. 5% is like nothing, just stop complain about everything... anyway, thx for the event, +5% will helps a little and pay only 10 silvervine for enriched ori/elu will save alot of my zenys. All ores should matter. Elunium/Oridecon should be an exciting drop to get because you can use it instead of it not being worthy for anything but those very basic safe levels. Over all the nature of the events were planning on restart is going to continue to work to encourage rewards for hunting and playing rather than just buying from the shop. i want it... ori and elu going cheaper, because 10 silvervine is more cheaper than overpriced 80k ORI and 70k ELU. Overupgraded gear going to be cheaper too, because every1 going to upgrade and the market is already satured of those items. Edited by Wyrd1, 17 October 2017 - 04:01 PM. Edited by Spoon, 17 October 2017 - 04:06 PM. Silvervine 10 is 73-80k. About the same as buying elu or ori. But now with more people needing it the prices will rise even more than what they're already rising. you trade an ori/elu and 10 silver vine for an enriched. It'll prob get more expensive with the event. Idk why people are worried about this 5% increase is not the same as renewal with safe to +7 or when you fail it just -1 rather than break. Edited by Bazzz, 17 October 2017 - 04:09 PM. 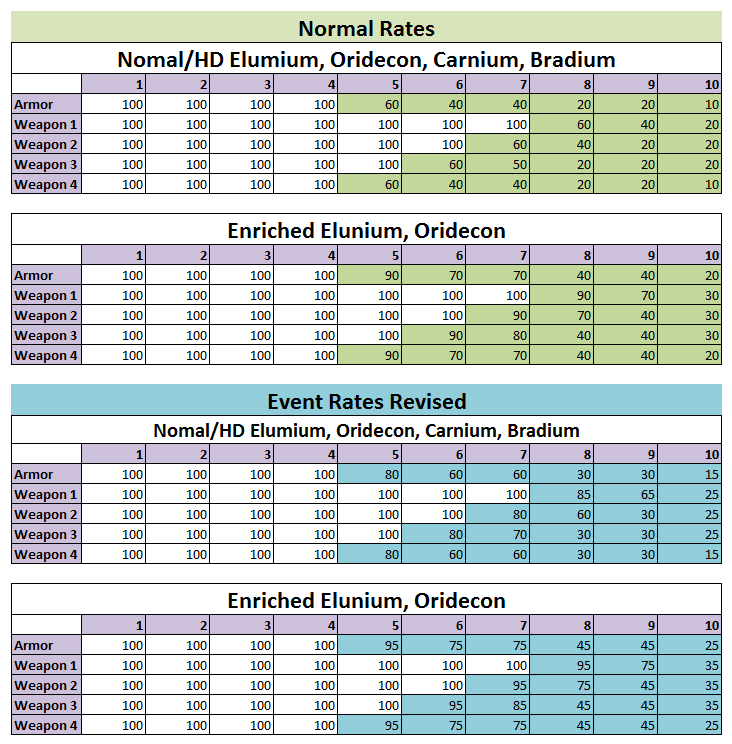 Question, you table about the chances talk about HD ores, mean you will put those for this event period? or will be implement permanent? and my request is...please TEST IT!, you remember what happening the 1st time you implement this kind of event in renewal? the HD Carnium and Bradium was working just fine but the enriched NPC just dont, give the normal chances so, was a break nightmare lol., so AGAIN, TEST IT PLEASE! now about the event whats going on? i click in the link but nothing new about the event lol. My issue is with further pushing Gear towards high upgrades trivially. Yes, elu and ori will be worth more but it will also cause silvervine to rise which is an important aspect. We don't really need easier upgrades in the current state of the game. I don't believe it's healthy in the long term. There are better ways to get people to play that aren't so damaging. Edited by Hrishi, 17 October 2017 - 04:52 PM. yeah so its more expensive to upgrade because of ori and silvervine going up which kind of counteracts the 5% tbh lol. the +9s don't really matter most gear doesn't even benefit from being over upped. More of a problem later when more gear has x% effect per upgrade. All I can think of atm is like evil bone wand +10 and skull cap +7. I guess maestro hat and firelock footgears. This event will prob just break a lot more gear than normal people trying go +9/+10 on stuff. Edited by Bazzz, 17 October 2017 - 04:56 PM. This event will work because its no longer baked into the server executable due to that. That is why we can configure the rates, because of that error we pushed for it so we can be sure the event is happening 100% as intended. The zones also spit out a log of the current refine rates on start up so we can double check.